Donate to Buckeye and Libby's Surgery Fund! 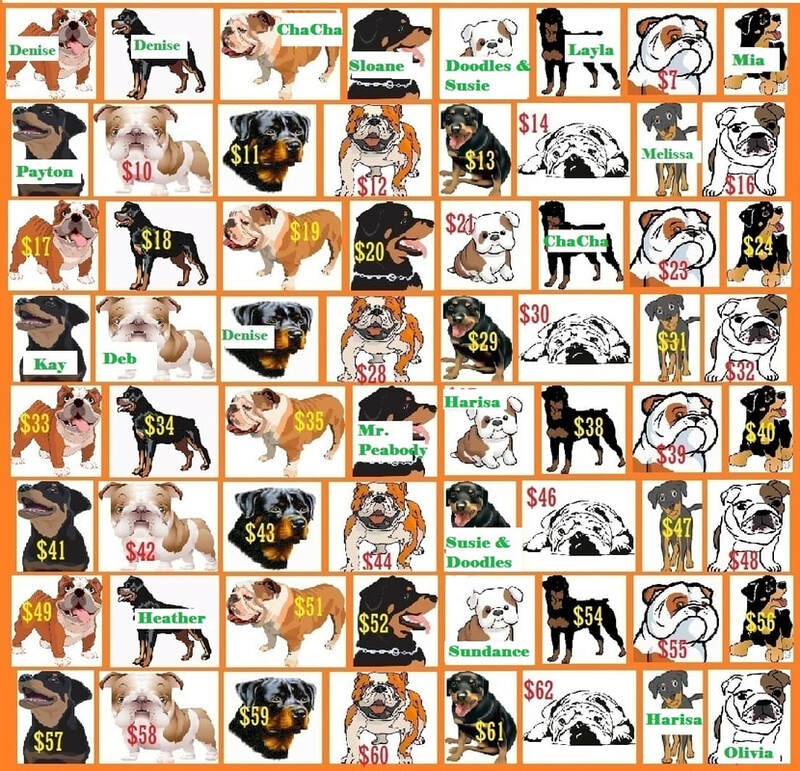 Just choose a dog with the dollar amount that you would like to donate. Click on the dog to actually make your donation. We will then change the dollar amount on the dog to your first name on the grid. Then that amount will not be able to be donated again. We hope to have names on every dog in the grid. If we do we will have raised $2080.00 toward both dogs' surgeries! You can choose as many dogs as you like! The moment BUCKEYE walked in the yard we noticed that he was limping on his back leg. We made a note that to have Dr. Lindsay check it when he went to get his medical cares done. In spite of his sore leg, which was so painful that he sometimes drug it behind him, he enjoyed playing with all the toys. Buckeye excitedly pulled all the toys from the toy box. When he couldn't reach the toys in the bottom, he simply pulled the toy box over and got the very last treasures. The appointment with Dr. Lindsay revealed what we feared. Buckeye needs surgery on that back leg. Dr. Lindsay told us to set up an appointment with IVRC for an extra capsular surgery. The cost will be around $1800.00. Libby came to us with a history of abuse. An owner in her past had not been kind and Libby suffered as a result. Libby is heart worm positive and also has an ACL tear. Libby chose to let her past go. She focused on staying loving instead of becoming aggressive in spite of the humans who had abused her. The lady who helped Libby tried to get a rescue to help her with Libby. She was told repeatedly to just put the dog down and that it wasn't worth doing the heartworm treatment and ACL surgery. We believe that Libby deserves to live. We believe that the strength she showed in overcoming the past is the same strength that will get her through her heart worm treatment and the leg surgery and on to a home that will give her all the love she deserves. The cost of Libby's surgery will be around $2500.00. Let's show these dogs the side of humans that is loving, caring and giving. Buckeye and Libby need your help! Please donate to their surgery fund.